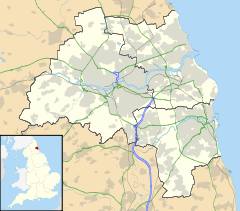 Washington is a new town in the City of Sunderland local government district of Tyne and Wear, England, and part of historic County Durham. Washington is located geographically at an equal distance from the centres of Newcastle, Durham and Sunderland, hence it has close ties to all three cities. Washington was designated a new town in 1964 and became part of the City of Sunderland in 1974. It expanded dramatically, by the creation of new villages and the absorption of areas of Chester-le-Street, to house overspill population from surrounding cities. At the 2011 census, Washington had a population of 67,085, compared to 53,388 in 2001. The origins of the name Washington are not fully known. The most supported theory (especially amongst local historians) is that Washington is derived from Anglo-Saxon Hwæsingatūn, which roughly means "estate of the descendents (family) of Hwæsa". Hwæsa (usually rendered Wassa or Wossa in modern English) is an Old English name meaning "wheat sheaf", the Swedish House of Vasa being a more famous cognate. "Hwæsa" – most likely the name of a local Anglo-Saxon chieftain or farmer. "ing" – a Germanic component that has lost its original context in English: ing means roughly "[derived] of/from". In the name Hwæsingatūn, "ing" is conjugated to "inga" in accordance with the genitive plural declension of OE. "tūn" – root of the modern English "town", and is a cognate of German Zaun (fence), Dutch tuin (garden) and Icelandic tún (paddock). The word means "fenced off estate" or more accurately "estate with defined boundaries". The combined elements (with all correct conjugations in place) therefore create the name Hwæsingatūn with a full and technical meaning of "the estate of the descendants of Hwæsa". However, there has been no evidence found of any chieftain/land owner/farmer in the area by the name of Hwæsa, although any such records from the time would likely have been long lost by now. Although this is by no means the definite theory of origin, most scholars and historians (especially local) agree that it is the most likely. Another of the popular origin theories is that Washington is in fact derived from the Old English verb wascan and the noun dūn meaning "hill"; thus making the name Wascandūn, meaning "washing hill". This theory likely originates from the proximity of the river Wear to the actual Anglo-Saxon hall at the time (most likely where Washington Old Hall stands today). This idea is not backed by linguistic evidence. Combining the two Old English words "wascan" and "dūn" would actually have meant "washed hill" and not "washing hill". Also, the Old English "dūn" meant a range of gently rolling hills, as evidenced by the naming of the North and South Downs in southern England. Plaque in Durham Cathedral's cloisters for John Washington, who was Prior there. William de Wessyngton was a forebear of George Washington, the first President of the United States, after whom the US capital and many other places in the United States are named. Though George Washington's great-grandfather John Washington left for Virginia from Hertfordshire, Washington Old Hall was the family home of George Washington's ancestors. The present structure incorporates small parts of the medieval home in which they lived. American Independence Day is marked each year by a ceremony at Washington Old Hall. The Old Hall may have been built by William de Hertburn, who moved to the area in 1183. As was the custom, he took the name of his new estates, and became William de Wessyngton. By 1539, when the family moved to Sulgrave Manor in Northamptonshire, the spelling "Washington" had been adopted. The present Hall is an early 17th-century small English manor house of sandstone. Only the foundations and the arches between the Kitchen and the Great Hall remain of the original house. The Galleries shopping centre is the town's main commercial centre. Washington's design was developed through the New Towns concept aiming to achieve sustainable socio-economic growth. The new town is divided into small self-sufficient "villages". It was originally also divided into the 15 numbered districts, a fate that confused many visitors to the area. These numbered districts have gradually been removed as well as increased, and now road signs indicate the villages' names instead of district number. Mount Pleasant was also added to the list of numbered districts (14), despite being out of the Town "boundary line" of the River Wear and having a DH4 Postcode (Houghton le Spring); however, it does hold a Washington dialling code starting 0191 415/416/417. Built on industry, Washington contains several industrial estates, named after famous local engineers, such as Parsons, Armstrong, Stephenson, Crowther, Pattinson, Swan and Emerson. A lot of the land that makes up the town was purchased from the Lambton family, Earls of Durham who own the estate of the same name, which includes their ancestral home, Lambton Castle. In 1970, Washington hosted the English Schools Athletic Association (ESAA) annual National Championships, attended by the then Lord Lieutenant of County Durham. On 15 November 1977, the very first SavaCentre hypermarket (a venture between Sainsbury's and British Home Stores) opened at The Galleries. By 2005, however, it had been rebranded as a traditional Sainsbury's as the SavaCentre brand was phased out. The former Court House on Liberty Green has now been converted into private residences. Historically, Washington was heavily involved in the coal industry with a number of pits. One of these in the Albany district of Washington is preserved as the 'F' Pit Museum (pits in Washington were named alphabetically e.g. the 'F' Pit). A number of the old communities of Washington grew up around the pits (e.g. the modern area of Usworth partly grew up around the Usworth mine and the area was known as Usworth Colliery (and still is to some of the older generation). In support of the mines, there was a series of wagonways and later railway lines to transport the coal. The wagonways took coal to Staithes on the River Wear, where it could be loaded onto barges to be taken to the oceangoing vessels at Sunderland. Washington was also involved in the chemical industry and the Washington Chemical Works was a major employer in the 19th century. This later became the Cape/Newalls Works, which produced insulation. The Pattinson Town area of Washington grew up around the chemical works. This area is now Pattinson industrial estate and Teal Farm housing estate. Currently, Washington's main industries include textiles, electronics, car assembly, chemicals and electrical goods. The Nissan automotive plant is a major employer. Nissan is the largest private-sector employer in the City of Sunderland. Goodyear Tire and Rubber Company, the American tyre production giant, opened a new factory in Washington in 1968. However, it closed on 5 July 2006 with the loss of 585 jobs. The Wildfowl and Wetlands Trust nature reserve and the Washington 'F' Pit mining museum are within the town. The Washington Arts Centre is a converted farm building. The Centre includes an exhibition gallery, community theatre, artist studios and a recording studio. The North East Aircraft Museum occupies part of the old RAF Usworth base. The Nissan plant takes up much of the rest. The municipal airport previously run from the site was closed to make way for the Nissan plant. There are several primary, secondary schools and colleges in the villages of Washington. The North East of England Japanese Saturday School (北東イングランド補習授業校 Hokutō Ingurando Hoshū Jugyō Kō), a Japanese weekend supplementary school, holds its classes in the Oxclose Community School in Oxclose. Washington F.C. is a club based in the Northern League Division Two which is the tenth level of the English game. In 2005, Washington R.F.C was established. The club currently plays in Durham and Northumberland Division 3. Washington is located on the mothballed Leamside line and, until the mid-1960s, had regular passenger services to Sunderland, Teesside and Newcastle upon Tyne, via Pelaw Junction. Freight services continued until 1991 and the line is currently out of use, with all major infrastructure extant. Washington is therefore one of the largest towns in Britain without an operational railway station (see Dudley, Newcastle-under-Lyme and Gosport). In June 2009, the Association of Train Operating Companies called for funding for the reopening of this station as part of a £500m scheme to open 33 stations on 14 lines closed in the Beeching Axe, including seven new parkway stations. There is a major bus station situated at The Galleries, and another at Concord in the north of Washington. The primary provider of transport (buses) in the area is Go North East, with local services as well as connections to Newcastle upon Tyne, Sunderland, and many other towns and cities in the region. Major roads run through Washington: the A182, the A1231 and the A195 all connect to the A1(M) motorway (which acts as the western boundary of Washington proper) or its feeder, the A194. Washington Services is situated between Junctions 64 and 65 of the A1(M), and incorporate a Travelodge. Gertrude Bell was born at Washington Hall. The musician Bryan Ferry (of Roxy Music fame) comes from Washington and attended Washington Grammar School (now Washington School). Heather Mills, notable for marrying Paul McCartney, attended Usworth Grange Primary School and Usworth Comprehensive School. The musician Toni Halliday from the band Curve went to Washington School (Comprehensive). Sunderland, Everton and England goalkeeper Jordan Pickford was born in Washington. ^ "Report for Washington Area Committee". Sunderland City Council. 7 January 2010. Retrieved 1 January 2019. ^ "citypopulation.de". Retrieved 28 April 2014. ^ "A guide to Washington, Tyne and Wear. Washington tourist information, local contacts, attractions and reviews". ^ "Guide to American Presidents: GEORGE WASHINGTON". Burke's Peerage and Gentry. Retrieved 31 March 2012. ^ "Washington Old Hall". National Trust. Retrieved 31 March 2012. ^ "LOCAL STUDIES CENTRE FACT SHEET NUMBER 12:Washington Old Hall". Sunderland City Council. Archived from the original on 3 November 2014. Retrieved 31 March 2012. ^ "Dame Margaret's Home, Washington, Durham". Children's Homes. ^ "The Sainsbury Archive". Museum of London. ^ "Washington Savacentre Football League". ^ "所在地." North East of England Japanese Saturday School. Retrieved on February 15, 2015. "C/O OXCLOSE COMMUNITY SCHOOL DILSTON CLOSE, OXCLOSE, WASHINGTON, TYNE & WEAR, NE38 0LN"
^ "Move to reinstate lost rail lines". BBC News. 15 June 2009. Retrieved 15 June 2009. ^ "Jordan Pickford". Everton F.C. Wikimedia Commons has media related to Washington, Tyne and Wear. Wikivoyage has a travel guide for Washington (England).